Rocket thrust: where does the rocket propulsion come from? 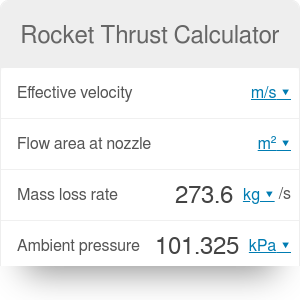 The rocket thrust calculator uses the Newton's third law and calculates the net rocket propulsion, taking into account the pressure difference between the ambient pressure and the pressure at the rocket nozzle. This calculator can be used not only for rockets themselves but also for any kind of vehicle that uses a jet-rocket engine as its main propulsion since the thrust formula is vehicle-agnostic. Newton's third law states that for every action there is a reaction of equal strength and opposite direction. This means that when you pull a rope, the rope pulls you back with the same strength. This is the basis of rocket propulsion and rocket physics in general. The amount and speed at which the burnt fuel is exhausted of the rocket nozzle determine how fast the rocket will accelerate and what amount of kinetic energy it'll gain. This is the reason why a jet rocket engine consumes big amounts of fuel, but also why it is so powerful. In designing a jet rocket engine it is important to balance the size of the rocket nozzle in relation to the body of the rocket itself. Given the nature of fluid and rocket physics, a smaller nozzle will make the exhausted fuel move faster but will allow less of it to be exhausted per unit time, so it is important to build a rocket nozzle with the proper size for the desired rocket thrust. The importance of the rocket nozzle area is shown in this rocket thrust calculator by the variable A - you can test how different sizes would impact the net rocket propulsion. The right side of the rocket thrust equation is the one used in the rocket thrust calculator, where it is important to point out that dm/dt represents the variation of mass with time (which is the mass exhausted by the jet rocket per unit time). Let's see now what are all those variables and introduce some typical values for them. We will use rounded values based on the characteristics of the Merlin 1D rocket engine, which is used by SpaceX in its Falcon 9 and Falcon Heavy rockets. Ve-opt: Effective exhaust velocity at the rocket nozzle if Pamb = Pe. For our example we used a typical value for a liquid-propellant rocket: 3 km/s. Ae: Flow area at the nozzle exit plane. In the case of the Merlin 1D engine it has a diameter of 1.25 m which we convert to an area of 1.227185 m2 using the circumference calculator. dm/dt: Flow at which mass is exhausted. We obtain a value of 273.6 kg/s using the advanced mode. Pamb: Ambient pressure around the rocket (check the pressure conversion tool for using different units). For our purposes, we will use atmospheric pressure (default value) of 101325 Pa.
Pe: Static pressure at the jet rocket exhaust. For our example we will set it to a reasonable 84424 Pa.
F: Net force or rocket propulsion (rocket thrust); it is the main quantity of interest. We obtain a thrust of 800 kN which is well within the capacity of a Merlin 1D engine (maximum thrust is 825 kN at sea level). dm: Mass expelled at the rocket nozzle in a time dt. In our example the total fuel mass of the first stage of the Falcon 9 is 44320 kg per engine. dt: Time elapsed in the expulsion of the aforementioned mass dm. The total fuel burn time in the first stage of the Falcon 9 is 162 s.
The values have been obtained from a combination of a combination of sources including Reddit, Falcon 9's official webpage and Wikipedia articles. One of the interesting takeaways from this thrust formula is that the net thrust for a given jet rocket engine will increase with altitude, since the pressure decreases with altitude and hence the negative contribution of the Pamb is reduced increasing the total rocket propulsion. Once the net thrust (or force) is obtained you can use a tool like the acceleration calculator to obtain the acceleration at which such a rocket can be launched. Rocket Thrust Calculator can be embedded on your website to enrich the content you wrote and make it easier for your visitors to understand your message.